A multi-level parking structure that will hold 280 cars is nearing completion next to the Atlantic station. Work crews laid the last concrete deck on a 3 ½ level parking structure at the Atlantic station at the end of the Eastside Gold Line last week. A multi-level parking structure that will hold 280 cars is nearing completion and is targeting a late March opening. Parking will be free for transit patrons, with no need to stop and purchase tickets or bother with electronic gates. Los Angeles County Sheriff’s deputies will patrol the property for security purposes. There are 16 individual bike lockers and racks that can hold eight other bikes. Only one other new station on the Gold Line Eastside Extension has parking — the Indiana stop, which has 43 free spaces. There has been very limited parking in a store lot for Gold Line customers at the Atlantic station during construction of the new garage. The garage is flanked by Kaiser Permanente East Los Angeles Medical Offices on the west and Pep Boys directly across the street. 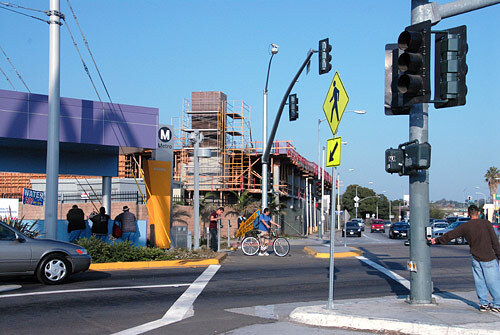 Architect William Villalobos, who designed the Mariachi Plaza Station and served as the onsite construction architect for the entire Eastside Extension project, described the parking structure project in terms of form and function. Klorman Construction was contracted by Metro to design and build the parking facility. Metro will conduct the close-out inspections and certification according to safety and building code standards. “We’re pushing to open by the end of March,” said Project Director Fred Smith.